(Pelham, Alabama) — Whitman Publishing is releasing a new book by fireworks expert Dr. John Conkling. BOOM! America’s Ever-Evolving Fireworks Industry will debut at the 69th Annual Meeting and Convention of the American Pyrotechnics Association in San Diego, October 2–6, 2017. The richly illustrated 240-page hardcover book retails for $29.95. It can be pre-ordered from the publisher (at Whitman.com) and will be available to the general public after the convention. A portion of its proceeds will benefit the APA’s Safety & Education Foundation. Whitman Publishing is best known for its books on numismatics (the study of coins, paper money, medals, and similar items), and some “heavy hitters” in the collectibles field opened their archives for the richly illustrated BOOM!. Q. David Bowers, known as the “Dean of Numismatics” and the most prolific hobby author of all time, contributed photographs of Civil War tokens struck for George Parsons of New York City, a fancy-goods and toy merchant who also was the New York agent for J.W. Hadfield’s “First Premium Fireworks” in the 1860s. Stack’s Bowers Galleries shared photographs of coins from 1906—a Barber half dollar, a Barber quarter, and a Liberty Head nickel—to accompany other artifacts from the 1906 San Antonio International Fair. The Fair included a “thrilling, realistic, spectacular” show of “The Fall of Port Arthur” (the longest and most violent land battle of the recently ended Russo-Japanese War), “terminating with a grand display of Manhattan Beach Fire Works nightly.”And Heritage Auctions, the world’s largest collectibles auctioneer and a major presence in the rare-coin market, contributed photographs of colorful historical memorabilia including old posters, magazine covers, postcards, autographed portraits, comic strips, and other collectibles relating to fireworks. Author John Conkling’s experience in the field of pyrotechnics goes back to the 1970s. In 1971 he was an assistant professor of chemistry teaching at Washington College in Maryland. In 1972, he stepped partway out of academia into a whole new world of fascinating people and technology—the world of fireworks. In BOOM! Conkling takes his readers behind the scenes and shares more than 45 years of hands-on experience in the American fireworks industry. 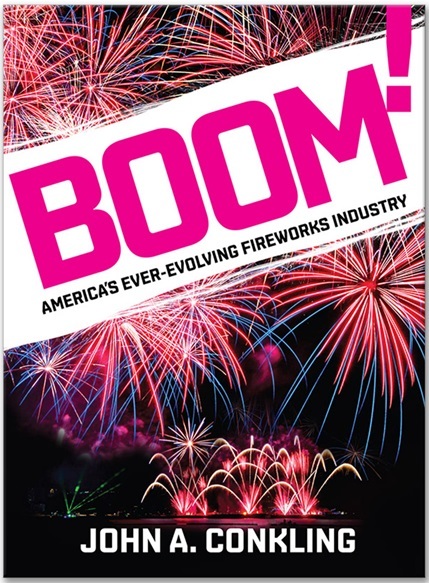 With a natural storyteller’s warmth and humor—and with unique insight from serving the American Pyrotechnics Association as its executive director and technical advisor—Conkling gives an engaging history of fireworks in the United States since World War II. He shares stories of the industry’s most famous personalities; his adventures traveling in China; the growth of federal regulations and the challenges they bring; and the innovations of American technology. He tells about the fireworks of yesterday, today, and tomorrow—and even gives advice on how to succeed in this booming entertainment field that brings joy to millions of Americans. More information on the APA’s Annual Meeting and Convention can be found at www.AmericanPyro.com or by contacting Executive Director Julie Heckman at jheckman@americanpyro.com. New York fireworks merchant George Parsons advertised his business with bronze tokens struck during the American Civil War. Numismatic expert Q. David Bowers shared photographs from his collection. Heritage Auctions (HA.com) and Stack’s Bowers Galleries (StacksBowers.com) contributed illustrations to BOOM! including coins and historical memorabilia. Fireworks have long been a feature of American comic art. These examples from the 1930s, 1940s, and 1950s are courtesy of Heritage Auctions. Dr. John Conkling is Emeritus Professor of Chemistry at Washington College, and retired Executive Director of the American Pyrotechnics Association. Conkling is the author of numerous papers, technical reports, and books on fireworks, including The Chemistry of Pyrotechnics—Basic Principles and Theory. He has appeared as a fireworks expert on the “Today” show, the Discovery Channel, the History Channel, the Disney Channel, and CNN. Whitman Publishing (www.Whitman.com) is the world’s leading producer of hobby-related reference books, supplies, and products to display and store coins, medals, and paper money. The company’s high-quality books educate readers in the rich, colorful history of American and world coinage and currency, and teach how to build a great collection. Archival-quality Whitman folders, albums, cases, and other holders keep collectibles safe and allow them to be shown off to friends and family. Whitman also publishes books on popular culture, American history and the presidency, military history, and other nonfiction topics.